In many industries plastics are the right choice but sometimes they should be the only choice. Applications involving ultra-pure water are one of those situations. Those involved in the industry know that any materials used cannot have contaminating material, nor can they leach – the technical term being that materials require “extremely low extractable contaminants”. Unfortunately, metals do contaminate – take for example the semiconductor industry. Metal (and anionic) contaminants can corrode electrical components or even shut down enzymatic processes, which would compromise quality and lead to the failure of the component. During the decade of the 1980’s the shift from steel to plastic started for these reasons. 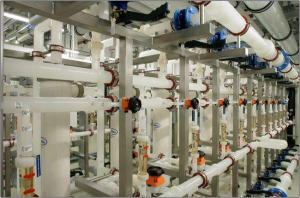 In the pharmaceutical and bioprocessing industries bacteria is a problem and porous materials that absorb moisture can also house colonies of microorganisms. These colonies can be difficult to control chemically and require a shutdown of the system. Fortunately, there are plastics available which do not absorb water, provide a haven for bacteria, or leach. A few examples are below, for more information you may wish to view this IAPD webinar on YouTube regarding the fluoropolymer options. stiff fluoropolymer and has higher abrasion resistance compared to many members of its “family”. It also has extremely low smoke generation and will not burn in air. This is combined with the benefit of a relatively low cost compared to some other fluoropolymers. Strong polar solvents and caustic substances are a concern, however. One of the most advanced fluoropolymers, ECTFE has outstanding properties. High tensile strength, good impact strength, outstanding chemical resistance. ECTFE also is a good electrical insulator and is UV resistant for outdoor applications. As you might expect, these properties come with at a high financial cost. However, in certain applications ECTFE may be the only option. Other fluoropolymers such as PFA and FEP have similar uses in high-purity water applications. PVC piping is so commonplace that it has almost become synonymous with “plastic pipe” – at least for the everyday consumer outside of the plastic industry. 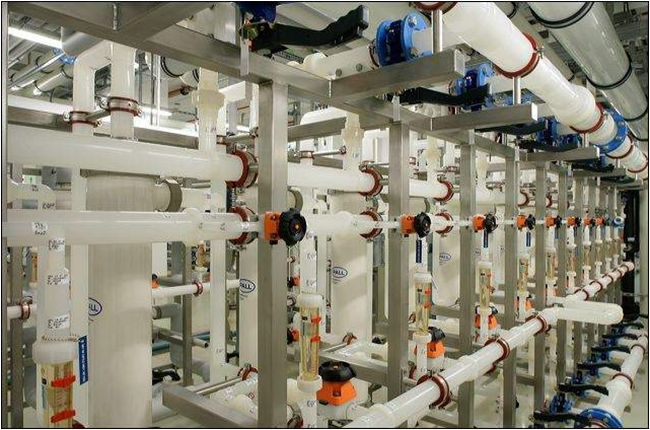 Fairly recently, specialized grades of PVC and CPVC have become available for high-purity water applications. These plastics have a reasonable cost compared to fluoropolymers and people are comfortable with the material. That said, note these are specific grades for high-purity applications and not in reference to standard PVC/CPVC.